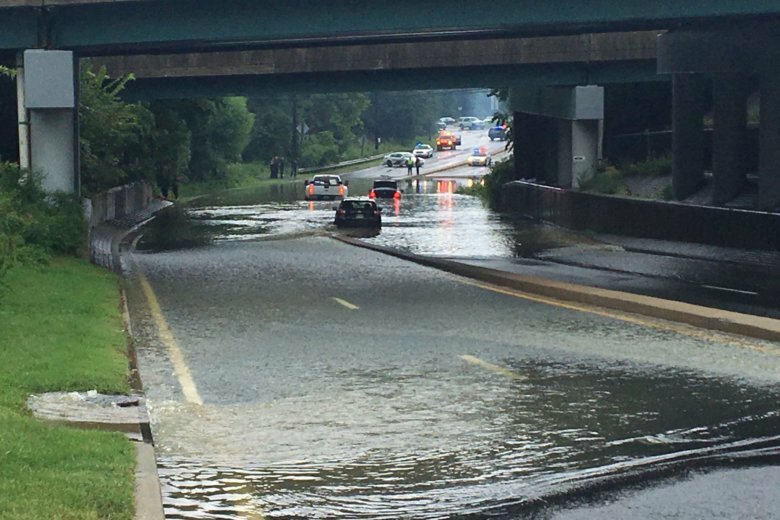 After torrents of rain throughout the region Tuesday evening, flooding conditions have closed multiple roads in the D.C. area and even a school in D.C. Wednesday morning. The good news? The threat of heavy rain and flooding will soon be over. WASHINGTON — After torrents of rain spread throughout the region Tuesday evening, flooding conditions have closed multiple roads in the D.C. area and even a school in D.C. The threat of heavy rain is expected to die down throughout the day, according to Storm Team 4 meteorologist Chuck Bell, but much of the soggy situation still posed problems for morning commuters. In Maryland, a flood warning is in effect for Prince George’s County until 1 p.m. The National Weather Service said the Water Street bridge in Upper Marlboro will be flooded; the river has crested and waters will slowly recede. In D.C., Eliot-Hine Middle School in Northeast is closed Wednesday due to flooding in multiple areas of the building. Students can still get a hot meal at nearby Eastern High School at 10 45 a.m.
Tuesday’s heavy rains caused flooding in many areas in the D.C. region. In Prince George’s County, Maryland, for instance, some roads were closed due to water. Flooding was also reported in a parking lot, and some had to be rescued from their cars by firefighters. The wet weather kicking off Wednesday morning may aggravate the still water on the roads. VRE alerted commuters to the flooding on Piper Lane that has closed the thoroughfare both ways between Virginia Route 28 and Observation Road to traffic. Broad Run riders should use the alternate entrance via Goodwin Drive to Wakeman Drive. All lanes are blocked both ways on Shreve Mill Road west of Sycolin Road due to street flooding. In Loudoun County, the bridge in the area of Stumptown Road near Bankfield Drive was damaged during Tuesdays storm and will be closed “for a significant amount of time,” according to the sheriff. All lanes both ways on Glen Mill Road and Glen Road are blocked by the street flooding. West of Wootton Parkway, all lanes both ways of Scott Drive are closed because of street flooding. Wednesday: Partly cloudy and breezy. Less humid. Highs in the mid 80s. Thursday: Mostly sunny with a pleasant breeze and low humidity. Highs in upper 70s. Friday: Sunny with low humidity. Highs in the upper 70s and into the low 80s. The soggy weather that soaked much of the region resulted in new rainfall records. Tuesday’s record of 2.72 inches of rainfall at Dulles International Airport broke the 2014 record of 1.43 inches. At Reagan National Airport, 2.46 inches of rain were recorded, breaking the record of 2.12 inches in 1906. If there are power outages from the storm they will appear on the map below.